What Size Were Brooches in the Middle Ages? I could just as easily have asked this question about any sort of common item, and because of my training I often do. I realized a couple of years ago that many people have a total misconception of the size of a lot of things that people used. Despite years of education and extensive training I am NOT completely immune to this problem. I sometimes buy small metal detector finds, and have been caught in this trap. A little while ago I purchased a very nice annular brooch (ring brooch). It was a good looking bronze piece which had a sort of twisted rope look. There were no dimensions given for the piece and I assumed that it was at least twice the size that it actually was. I was shocked when I saw how tiny the brooch actually was. This made me wonder how common an issue this really was. So, I looked at the given dimensions for many other items that were on sale. Then I went to a couple of the museum sites and looked at the actual sizes of the finds in the museum. And yes, there were a few really magnificent huge pieces, but in general the brooches and everyday pieces were rather small – at least by modern standards. Researching the size of the people who wore these items in England shows that women during the Middle Ages were generally about 5 foot 2 inches tall and men about 5 foot 6 inches. The article that I read said that this meant that Medieval Women were only an inch taller than modern women. I am 5 foot 9 inches tall. My grandmother, who was born in about 1890, was 5 foot 2 inches, but most of my female friends are at least 5 foot six. Now I consider myself to be a little taller than average, but not dramatically so. Is it possible that these brooches were sized smaller because the people were smaller, or were they sized smaller because of the value of the metal? I don’t think that we can give a definitive answer to this question, but I would love to hear people’s opinions on this topic. Metal really was a valuable commodity. Inexpensive metals like tin and lead were commonly used to make lower end pilgrim’s badges and decorative pieces. These metals both have a very low melting temperature, which means that they can be cast using a simple hearth. Pilgrim’s badges give us other important clues as well. Some tears ago I had the good fortune to meet with the curator of medieval artifacts for the Museum of London. Besides the sheer exhilaration of spending time with John in the bowels of the Museum storage looking at pilgrim’s badges, I also noticed the casual finishing of these ubiquitous items. Many of the badges had flashing left over from the manufacturing process. Modernly, we would expect those “manufacturing defects” to be removed. Casting and finishing of tin and lead are easy, so the condition of the pilgrim’s badges indicates the acceptance of a rough finish for some pieces. 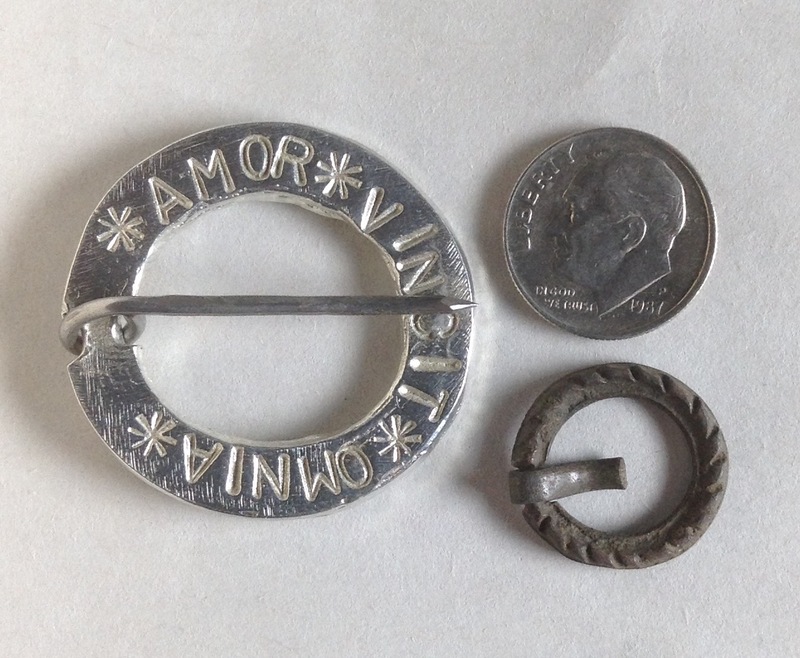 One of my pewter brooches, a dime, and the tiny brooch that I bought. This entry was posted in Dress Accessories, Jewelry, Metal Casting, Metal Working, Research, SCA Life and tagged brooches, dress accesorries, pilgrim's badges, research by Eirny. Bookmark the permalink.